Rated 5 out of 5 by Karavan from So much fun I loved this game even though I have only played the demo so far. I intend to buy it and continue. Just fun, silly and a real stress release game. There should be more like this. Even though its a solitaire game there are differences that keep you interested. Rated 5 out of 5 by Kitten78 from Great Solitaire Fun! I really enjoyed this game. It's relaxing, funny, and in my opinion different from other solitaire games. For one there isn't an undo option so you really have to be sure before you select. The "wild" cards are different than I've seen before too. Though tombstones are the same as like wedges from fairway solitaire. I just really enjoyed sitting back and playing this one. A fun game and a definite buy from me. Rated 5 out of 5 by SJC816 from Good Solitaire game This is your typical solitaire game...the zombie graphics and the bonuses make it a fun game. I enjoyed it. Just a relaxing fun game, no running around just relaxing solitaire. I'd recommend this game to others. Rated 5 out of 5 by raydog from Love this game! I usually will purchase all the card games because I get tired of looking for things in all the hidden object games. I enjoy all the card games but this one is really a hoot! I reviewed a sample version of this a while back and couldn't wait for it to be released. I am pleasantly surprised at how many levels it has. Love the entire zombie aspect of it ---- I am a big, big, big fan of Zombieland and loved that check list - just like in the movie! - We could have used a Tallahassee character. Made it more fun. 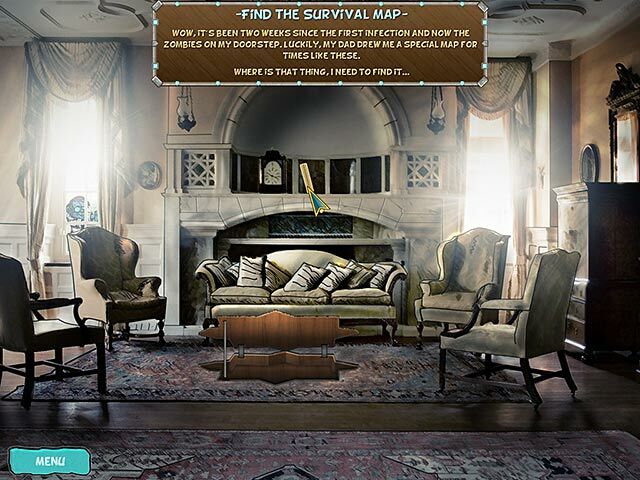 Rated 5 out of 5 by smuckers820 from MOOD SETTING GAME! I really enjoyed this game. It got me excited for the upcoming Halloween season. A true solitaire fan will greatly appreciate this game. I loved the "extras" you could purchase with the levels passed. I certainly needed them from time to time. I enjoyed the storyline, as small as it was. It was cohesive. In between each "venue" of play, there was a very mini interactive scene to progress you to the next level. Not difficult at all. It was a load of fun & I would definitely recommend it. Rated 5 out of 5 by Lyndy20 from Very entertaining I do enjoy the one up, one down type of solitaire. Nothing new with the card play, at least during the demo. There are cards that need to be unblocked, you get bonus cards in the deck, can buy other bonuses in a shop, etc, but there was enough quirkiness to the game that kept me highly entertained. Something a bit different to other card games are the fun mini-games that start each new area. I liked the cartoony look, the zombie sound effects and creepy music. Cards are clear to see and a good size. A definite purchase for me. Rated 5 out of 5 by DZukowski from A Zombie Apocalypse you WANT to see! This review is based on the demo. STORY: Zombie Solitaire makes light of a serious subject: What will we do when the world turns to zombies from eating tofu burgers? Culinary tastes aside, the answers arrive in the form of a map that guides you from home to a safe house. 5 stars! GAMEPLAY: The only negative thing I can say is that there is only the standard (one up, one down) style of solitaire. You hardly miss alternate versions, though. The game is packed full of fun special cards that allow you to nudge the cards a little in your favor while taking out zombies that block your way. Gold stars are the currency here, and gameplay gives a generous pocketful. Use them to buy special cards to help you out of sticky situations. 5 stars! VISUAL/SOUND: "Zombie" music plays throughout the game. Music and sound effects are great, adding to the fun. The artwork is clear and each card has a zombie on it, enhancing the experience that you are truly getting rid of zombies along the way. 5 stars! CHALLENGE: As mentioned earlier, there is only one style of solitaire. Alternate games would have been nice, but with all the fun it's not a big issue for me. The challenge factor will vary with your experience playing this type of solitaire. 4 stars! OVERALL: This one's a keeper! After playing the 1 hour demo, I intend to buy the game. Thanks, Big Fish, for offering a light, fun alternative to the dark HOG's you've been featuring recently. 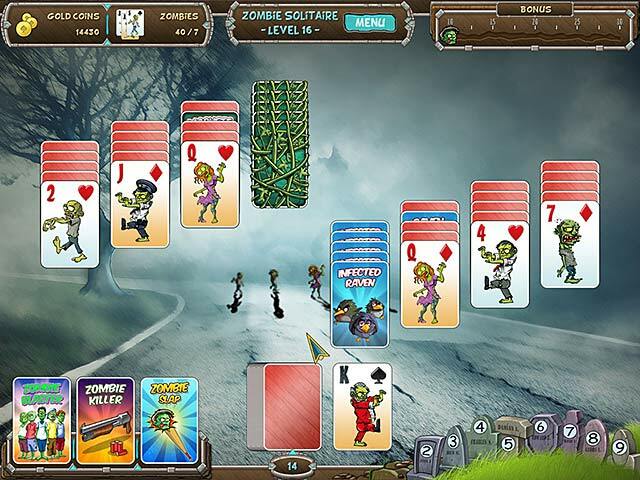 Rated 5 out of 5 by pennmom36 from EXCELLENT ZOMBIE SOLITAIRE! BWAINS!! Who doesn't love zombies? Who doesn't love solitaire? Best of both worlds here! There are new and exciting twists to this game. The goal is to pick a card on the solitaire board that is higher or lower than your shown deck card. If there is no playable card then you choose another deck card until hopefully the board gets cleared before you run out of deck cards. There are some cards that are blocked by vines or evil ravens until you uncover a machete card for example. Other bonus cards are available like a zombie slap which allows you to discard any card. You also collect cards 2-9 which can be used in order to progress with a larger combo. If you kill enough zombies and the deck is getting low a "run away" button is available but who knows you may still win, Gold is collected with each card you play or clear and the gold is used to buy more bonus cards.The game has a good zombie sense of humor and really is one of the better solitaire games out there, enjoy! Rated 5 out of 5 by PepsiAngelLady from Zombies and Solitaire Yawweee!!!!! Great fun if you love the higher-lower Solitaire. Got your Fairway feel with the Zombie twist. The Story line is a plus. 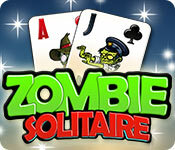 A fun Game and a must have for Zombie and Solitaire Lovers. Beware it is Highly Addictive. Enjoy this and maybe the Gov. Shutdown will go away. Right. LOL. Love ya, Mary. Rated 4 out of 5 by cowclaudia from Fun game The usual solitaire with some rather horrid levels that I had to play over and over but you accumulate funds fast to buy "Zombie Zappers," and other helpful items and game seems to go very fast tho it's not a short game. My only dislike is you don't have an undo function which is annoying but otherwise is worth the money. Rated 4 out of 5 by Gamevirgin from VERY FUN! BUT It's quite short for me. I have been spoiled by Fairway Solitaire, which Bigfish no longer carries, and Forgotten Tales Day of The Dead. These are two much longer and equally fun solitaire games! If you make this a lot longer, I would purchase it. I enjoyed the trial. Rated 4 out of 5 by JayDee1019 from Great...until it isn't This is a great game, but once it's over, it's...well, over. There's no bonus levels, no upgrades. Just...over. The little bits in between (like, getting out of the yard and onto the street) are a little lame and kind of a waste of time. I'd rather have more level, more complications, etc. Rated 4 out of 5 by VOLCANOGIRL from Solitaire With A Ghoulish Touch If your favorite mythical monster is the Zombie, and you love solitaire, you would love this game. But before you try this game, think really hard about what you want. Even if you think that this game won't be good, still try it... You'll probably regret you ever doubted this game. Rated 4 out of 5 by camjacques from Health Scare - Avoid eating Tofu Burgers! I bought this game with a free credit. It's certainly not worth buying otherwise. However, I did enjoy playing the one hundred and three levels. The basic story line is a guy eats a contaminated Tofu Burger and turns into a brain-eating Zombie and the disease spreads. You and a few others have to excape to Saved Island. At the start of each main level: home, town, factory etc, there is a ludicrously easy mini puzzle. That is you have to go down into the sewers, and surprise! surprise in order to do that you lift up a manhole cover. Then its the one up one down cards. that is a Queen can have a King or a Jack on it. The only obvious drawback is there is no undo button. So proceed carefully. If you kill all the zombies required you will receive three stars, and if there are more zombies left over than the target three bloody splats are your reward. I didn't know until late into the game that the gold you receive at the end of each level to buy extra-special cards ie ones to turn cards up so that you can defeat the zombie ravens and the weeds can be sold back to the shop. I might have done that when the level doesn't have weeds or ravens. I found the most useful card to buy was "New Deck". I certainly didn't try out all the different card choices in my first full game. There are numbered tombstones as well to help you win. It was fun to play over the Halloween holiday and that's really all I can say about it. Rated 4 out of 5 by Munch126 from Stupid fun with zombies Don't usually like anything, games, books, movies with zombies but this game is a heck of a lot of fun. Frustrating at times but definitely worth it. Rated 4 out of 5 by Ruckus777 from A spooky solitaire for Halloween! (OR THE ZOMBIE APOCALYPSE) Who knew tofu would turn you into a zombie??? The developers of this game obviously did! 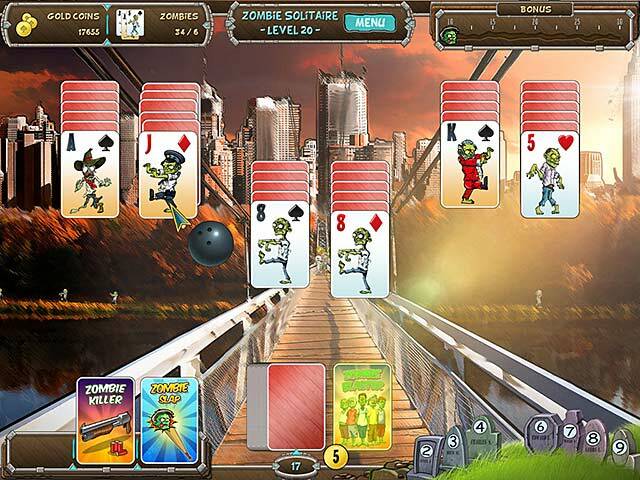 They took the idea of the zombie apocalypse and used their braaaaaiiiiiinnnns to merge it with solitaire. And it's a ton of fun! On the positive side, the game looks great and the storyline is funny and immersive. At the beginning of each level set (ingeniously tied to your escape plan map) you have to solve a quick little adventure puzzle and this alone kept me playing, wanting to see what the next adventure would be. On the negative side, the levels play through pretty quickly and after 60 minutes, I had played through 30 of what looked like probably 100ish total levels. I'm hoping they get more challenging as the game goes along, but with the powerful extra cards you can buy, you can make quick work of most of the game. But overall, a must for any zombie fan! Tofu, anyone??? Rated 4 out of 5 by carolinacat from Different Solitaire I played through the demo and I'm going to buy this one. I'm a big fan of solitaire and thought this would be too simplistic, but it does have a challenging edge to it. Once you figure out how to play to win, you can try to play every room to get three stars and it'll be more challenging. I don't care for the graphics, which could be much better, and the gameplay often is a little slow. But there's no timer, which I like, and you can challenge yourself each room to get all the stars without any penalties. Powerups are achieved by buying them with gold you win, but there's plenty enough to at least buy a couple. Rated 4 out of 5 by J4016C from Fun Game I like this game. It is fun, challenging, clear graphics. I would have liked to have seen different types of solitaire within this game. I do not like the bouncing balls. Too much noise. But all in all I would recommend this game for the times when you don't want to play a serious game or just want to decompress from a hard day at work. Rated 4 out of 5 by lynn106 from Enjoyable Halloween Solitaire I enjoyed playing the game and I even like the bouncing balls that drive some people crazy. I like special effects and sounds in my games - very satisfying to be rewarded when you do well. It is your typical solitaire game - nothing new. If you can afford the power-ups, it's nearly impossible to lose. Some levels without them are almost undoable. My only complaint is the screen transitions. Every level goes flying by every time you start a new game or go to the store. And the map that you keep being directed to is entirely unnecessary. Both of these features become increasingly annoying the longer you play. And wait until you want to go back and get a higher score on a previous level - every time it loads, it zips to the last level so you have to arrow yourself back to the beginning. If you like this type of game, and the above stuff doesn't drive you crazy, I think it may be a keeper. I bought it with a credit. Rated 4 out of 5 by wvsandy from Great fun My review is based on the demo. I really enjoy this type of solitaire - the one-up-or-down type, with Fairway Solitaire being my absolute favorite. This compares well with that classic game. Instead of being on a golf course, however, you are fleeing for your life from zombies. At the beginning of each chapter, you have to find play a little, easy mini-game, and then you play several levels of the card game to move on. There are power-up cards that you earn as well as extra cards that you uncover. You can also purchase these cards with the gold coins you earn throughout the level. I certainly had fun playing the game, and will probably buy it. However, I do have two nits to pick. First, there is no 'back' button so that if you miss a play, you can't go back and fix it. Secondly, when you reach the last card in the deck, if it doesn't have a play, the level ends not giving you a chance to use one or more of your extra cards to complete the round. For this reason I had to take away one star. But, as I said, all-in-all a fun game. Rated 4 out of 5 by kim0530 from Good Solitaire game The reason why I gave this a four star is because even though it's more then OK I really didn't love it either. I loved the music good for Halloween and as for the visual, they did an excellent job. Rooms looked realistic. This game has put me in the Halloween spirit. But, the solitaire is straight forward and it's not really challenging. As for the storyline, I't OK. I'm not a fan of zombies'. Since this is the beginning of October and Halloween is coming up, I'll wait to purchase this. Even though I like this game, I'm going to wait to see if there is something better. If not, then I'll purchase this. Rated 4 out of 5 by lonelyrider from Zombies The game was fun but it is rather hard to get started. I had problems understanding how to actually start playing the game. It is a game one plays at their own pace. Rated 3 out of 5 by winterstorms from very frustrating This game would be fine if it did not have a level which can not apparently be solved. I am an old man so can be stubborn as heck and have tried this one level 157 times so far never having less than 20 cards left. It seems that the computer simply does not want to lose. Rated 3 out of 5 by JustTheFacts from Light-hearted & Amusing BASED ON DEMO Good quality graphics drawn cartoon style, very amusing characters for each card. Music gets a bit annoying fairly quickly. A nice little story to keep us entertained. A toxic tofu burger creates an epidemic, and you must get away from your house to an island where you’ll be safe. There is a map, and as you complete each level, you move further on your journey. Dozens and dozens of repeatable levels. The game is a traditional solitaire game, with many different placements of the cards. There are lots of bonus cards, such as Zombie Slap, which removes the card of your choice and Machete, which opens up the Jungle Blocks. Another obstacle is Infected Ravens, which must be stopped by use of the Zombie Repellent. You get points by making combos (the number of cards you can select without drawing from the pack), the longer the combo, the greater the multiplier used at the end of the level. These points can be used in the shop to buy more power ups and bonus cards. I enjoyed the demo a lot, and it was amusing as well as absorbing. Rated 3 out of 5 by Porcelaincougar from Just okay. The ultimate solitaire game is Big Fish's own, Fairway! Give it a try, too much fun, and funny, you'll see what I mean! Rated 3 out of 5 by Queen_Mab from Nothing Unique or Special As mentioned in a previous review, this game is "nothing special or different". As a big fan of Zombies (have been for over 15 years) I was willing to give this game a chance even though I was pretty sure of what I would find. I wasn't surprised at all, this game is a cookie cutter repeat of another well known BF game. The only real difference is a lack of an undo option. The cards are very hard to read and I made a few mistakes because I misread them. This game really just lacks anything special and mostly is just cashing in on the zombie fad with an quick to market zombie game. There are so many better versions of this game already for sale at BF, this one just isn't worth it.